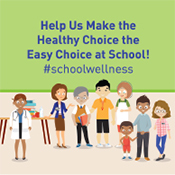 Support classroom and school events to have healthy foods and get kids physically active. Keep the wellness policy in mind when planning what foods and beverages to have at events and celebrations. The Smart Snack Lists below are approved snack items that may be brought to school for celebrations. If you would like to send a snack to be passed out to the students at the end of the day, this can be accommodated but you must notify your teacher in advance. Please note that students in your child’s classroom may have special dietary restrictions. If you are interested in becoming a member of the South Bay Union School District's Wellness Committee, Please call Child Nutrition Services at 619-628-5390 or attend one of the scheduled meetings listed below.